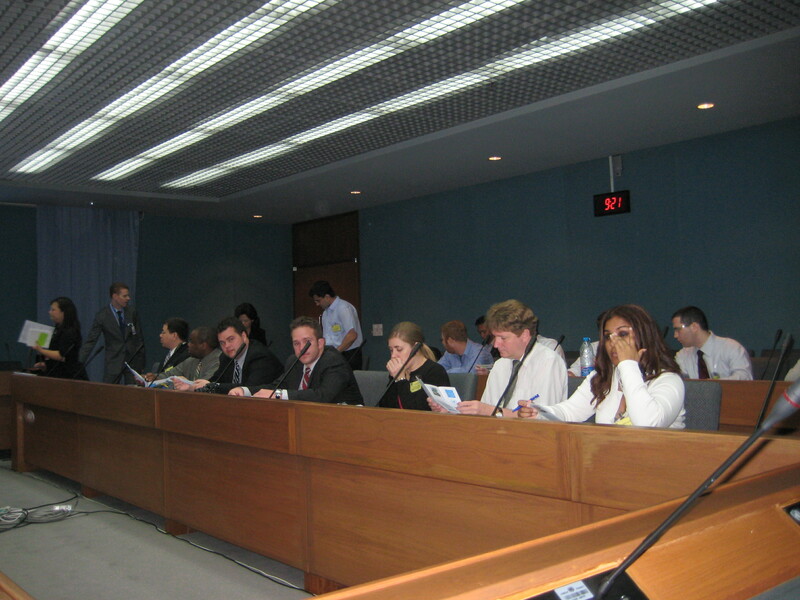 Tuesday, January 15: In the morning, we have lectures at the United Nations in Bangkok. Thailand is a strong supporter of the United Nations and has contributed to UN peacekeeping operations. It has also ratified a range of UN human rights, labor and environment conventions and treaties. Much of the UN’s regional organizations are based in Bangkok, including the UN Economic and Social Commission for Asia and the Pacific (ESCAP) and the recently established Asia-Pacific regional center of the United Nations Development Programme (UNDP-APRC) (UN Thailand). 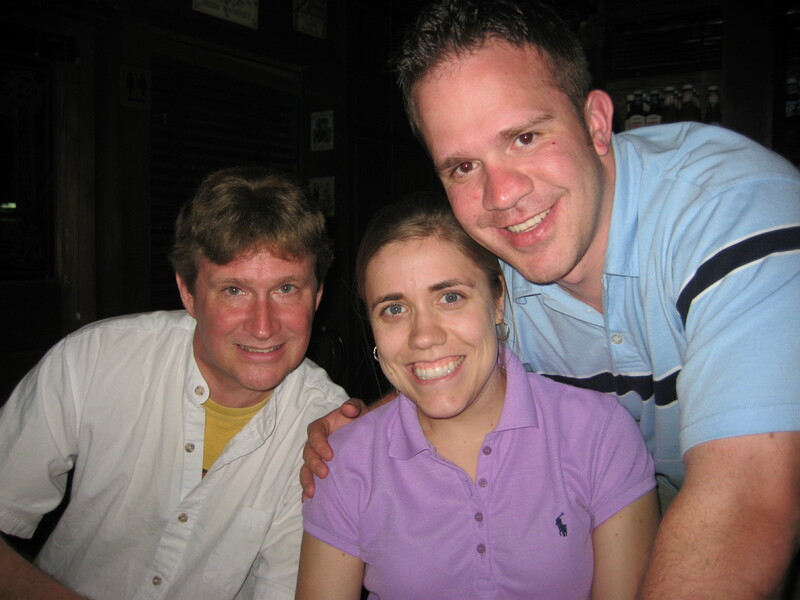 I was so happy to talk with you yesterday! It does seem awkward talking to you on the phone and somehow I never can tell if you still feel the same about me or not. I know it’s hard for both of us to talk on the phone. Somehow I never seem to say what I’m thinking. But truly, I am thinking that I miss you so much. You are constantly on my mind. I will probably have to write back later today from an internet cafe because I only have a few minutes here at the UN computers. I don’t want my time to run out before I send this. Time is almost out, so for now, goodbye. I miss you and love you and can’t wait to see you again. This afternoon, after our lectures, I take the sky train from Phrom Phong, near our hotel, to Surasak; I am in search of a Hindu temple. The sky train is 40 baht each way ($1.34) and quite high-tech. 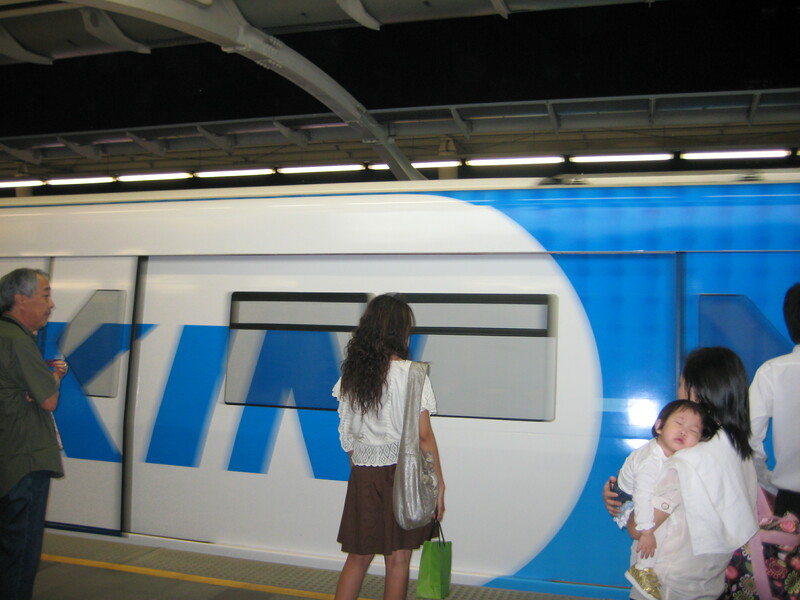 From the outside, it looks like a solid train covered in advertisements, with no windows, but on closer view there are dots painted in patterns on the windows, so that insiders can see out, but outsiders can’t see in. Inside, seats line the walls, facing each other, and in the middle are red rubber loops where people in the center can hang on. I can’t figure out how to tell at which station we are until I notice TV screens mounted on the ceilings. In between high-tech advertisements and music videos, the upcoming station is announced and written in Thai and in English. It’s very modern. 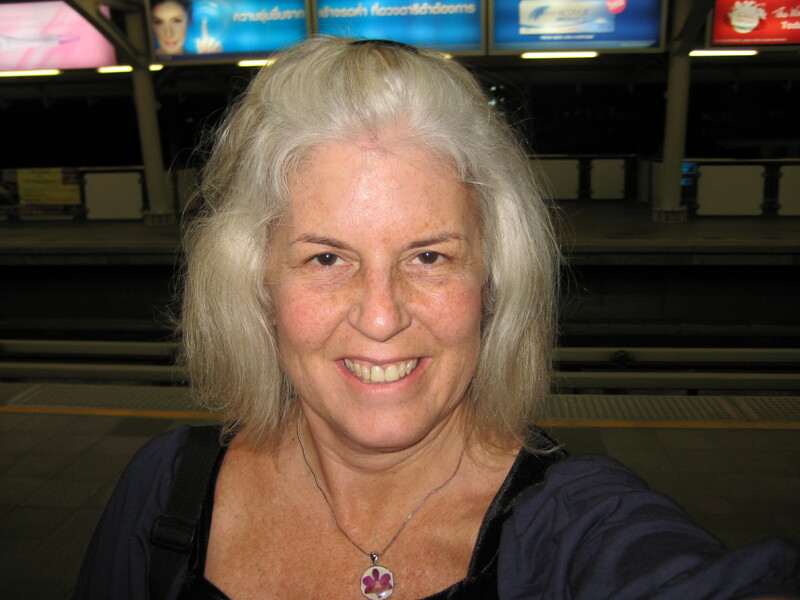 I become a little disoriented when I get off the sky train, so I head down some side streets trying to orient myself. Suddenly I am surrounded by throngs of schoolchildren in uniforms of black pants and white shirts. I have walked into the middle of the Bangkok Christian College as the kids are released from school. They are roaming all over the streets eating snacks from street vendors. It’s quite a commotion. 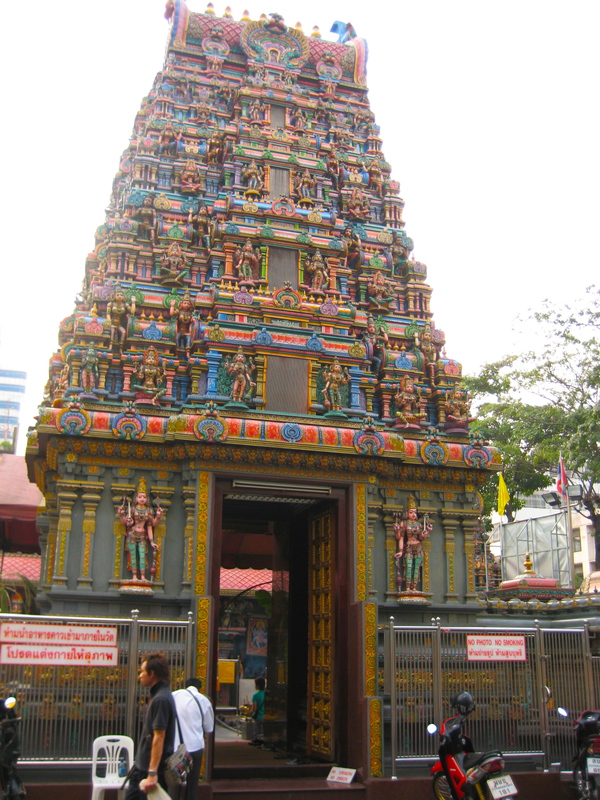 I find the Hindu temple, Sri Maha Mariamman Temple, on the corner of thanon Silom and thanon Pan. 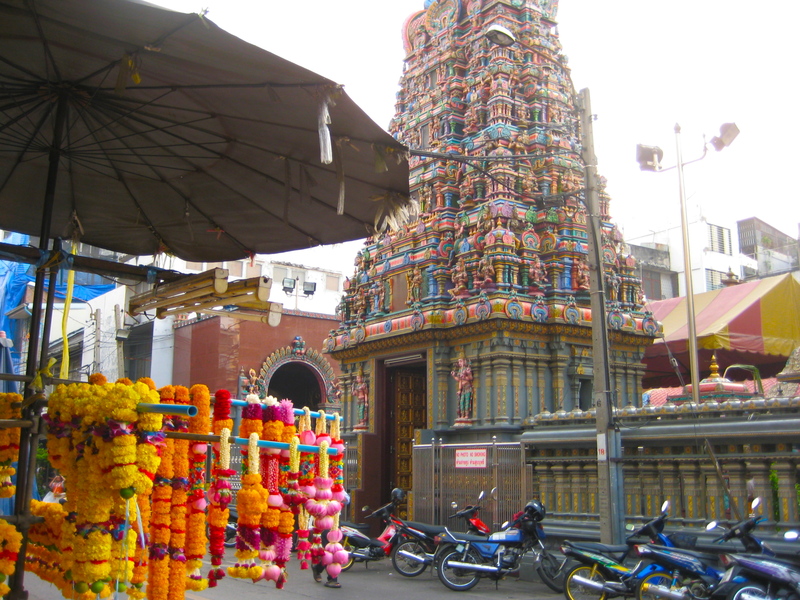 Outside the temple are street vendors selling colorful flowers and fruits for offering to the Hindu gods. Apparently the temple is devoted to the goddess Uma Devi and is bursting with colorful plaster statues of deities. 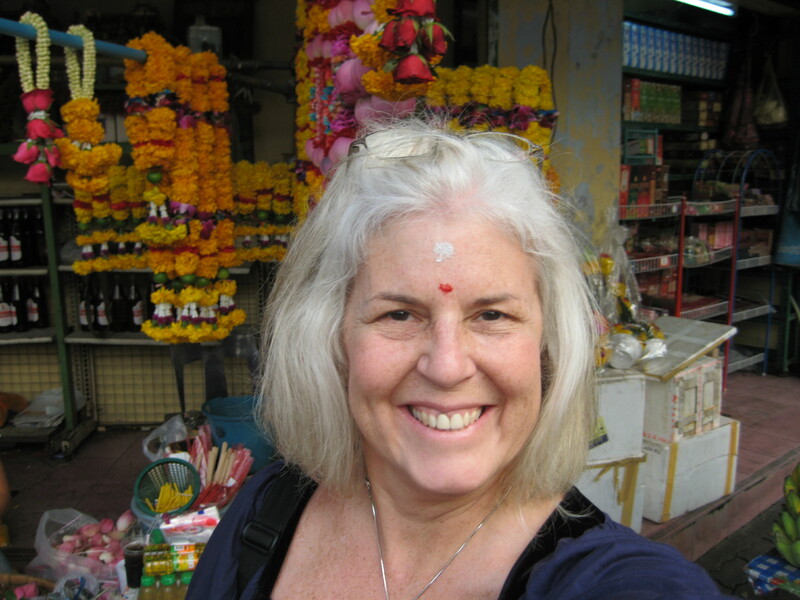 I walk in, take off my shoes, and begin walking slowly around the perimeter of the temple counterclockwise. 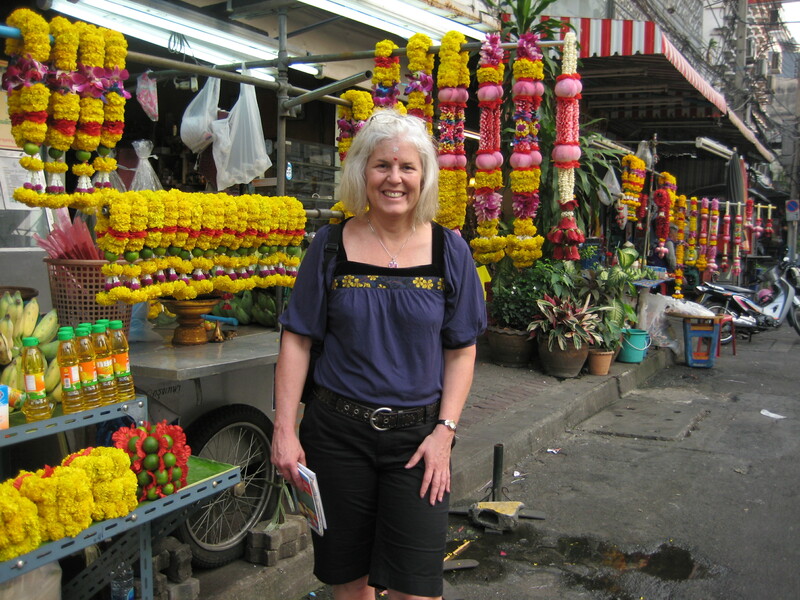 An American woman in a sarong advises me quietly that I might want to consider walking in the other direction, clockwise. That is the normal way it is done, she tells me knowingly. After turning and walking around in the proper direction, I go inside to see the Hindu statues, surrounded by wilting offerings. A man in a diaper-like cloth comes up and puts a red and a white dot on my forehead. I enjoy walking down thanon Silom with the two dots on my head, feeling very exotic. Riding on the bus through the city, I observe a lot of interesting things. In a construction parking lot, a group of 5- or 6-year-old children are playing, without any apparent supervision. Most street signs are in English and Thai. Photographs of a youthful gold-clad King are everywhere. Many people in the streets are wearing black and white as they are currently in mourning for the King’s sister, who recently died. Thai graffiti covers corrugated aluminum fences. I see many familiar businesses: 7-Eleven, Orange Julius, The Love Boat Club, Goodyear, Green Ninth, Gloria Jean’s Coffee, Laser Center Clinic, McDonald’s McCafé, Syntec Construction, Coyote, Pasta ‘n Noodles, Starbucks, Pizza Hut, KFC, Hard Rock Café. One thing I observe about the Thais is that those who work as street vendors are quite industrious. In front of the 7-Eleven down the street from our hotel is a thriving restaurant business crowded onto the corner. A number of vendors are cooking up meals and seating people on plastic chairs. One can eat a full meal, accompanied by a soda from the 7-Eleven, and then grab an ice cream from the store to eat with fruit from a vendor. 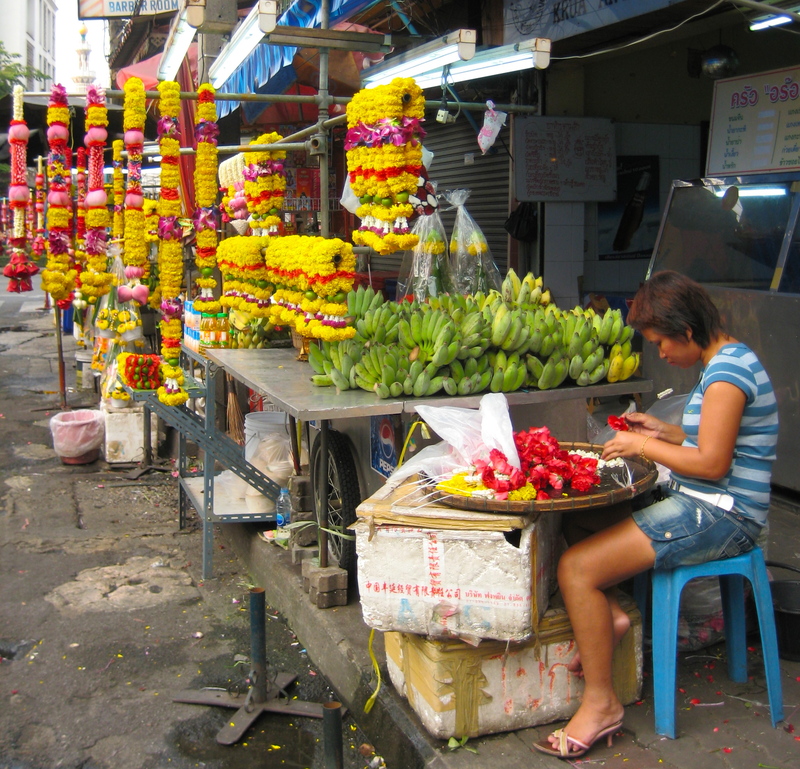 Further down Sukhumvit Road, I encounter vendors selling shoes, making flower arrangements and garlands, making fruit shakes, and cooking all kinds of food. Compared to Mexican street vendors I observed in that country, the Thais are highly industrious. Most of the Mexicans just passively sat on blankets spread on the street; most were selling worthless trinkets. The Thai vendors seem much more active and thriving. The city is not very pedestrian-friendly. The traffic is horrible and there are not many pedestrian crossings. I put my life on the line many times to get across the street. 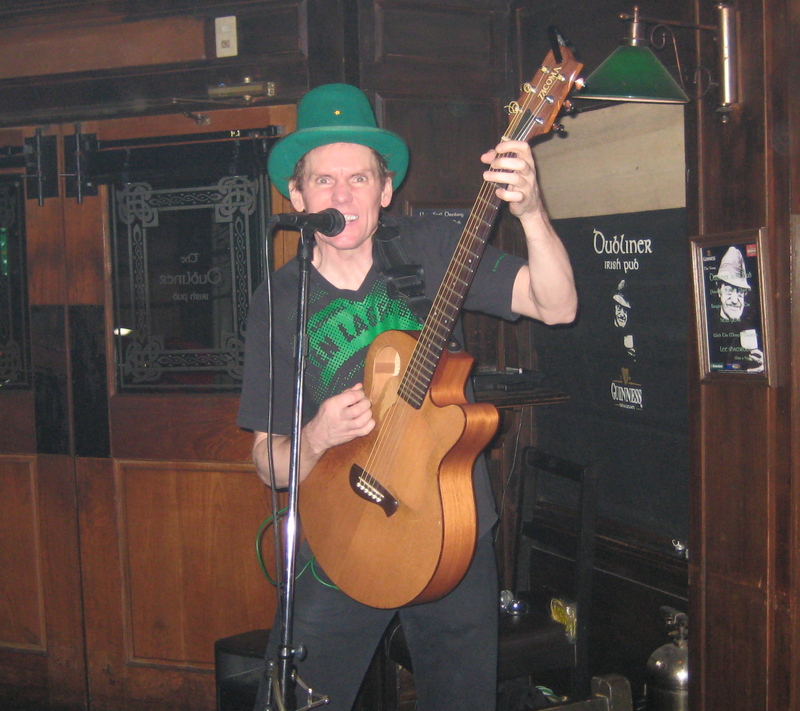 In the evening, some of us go to the Dubliner where we drink a few beers and sing along with an Irish singer. On the way back from the bar, I stop to have my fortune told by a smelly woman on the street. 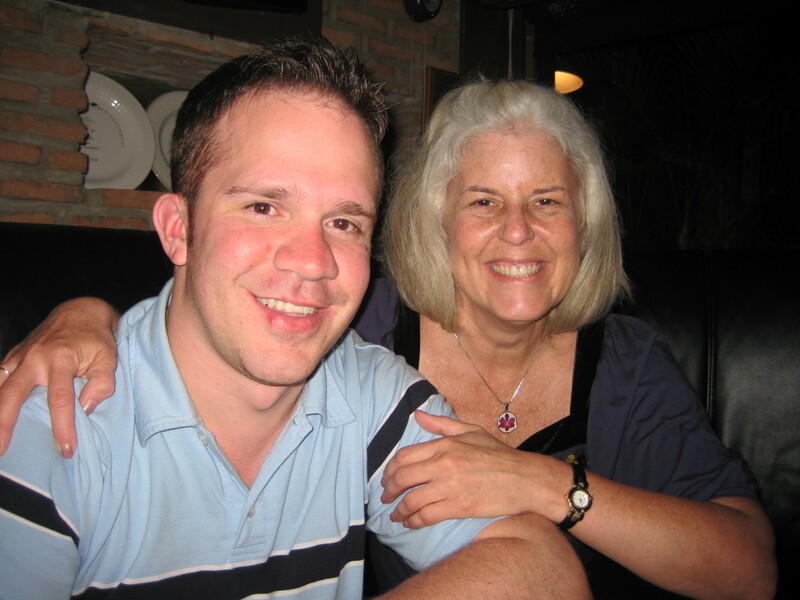 She tells me I will live to 95-100; that I will never again have love in my life, only friendship; that she sees me having a good job, but money in, money out; that I have a lot of stomach problems; and that I will meet a married man in 2009 who is bad karma. Not such good news from the Thai fortune-teller!